Improving employee well-being by helping to resolve personal issues. A healthy work/life balance is important to a productive workforce. There are times when work performance may suffer due to employee’s personal problems. The Aspirus Masters level counselors can help get your employees back on track. By offering support and guidance to barriers that are in the way of optimal performance, the health and productivity of the workplace are preserved. EAS helps provide a life in balance through short-term counseling. EAS help provide a life in balance. Employers contract with Aspirus EAS to provide services for their employees and household members. Counseling Services - Licensed Masters-level counselors facilitate meetings with an individual or individuals in a confidential face-to-face setting. Individual, marital, and family short-term counseling services are available to your employees and their household members. Short-term counseling is defined as a limited number of sessions per episode of need. Sessions typically run from 50 to 60 minutes in length. Referrals - Most Aspirus EAS clients are self-referrals. A supervisory referral may occur when work performance has become problematic. Supervisory Consultations - Human resources and/or a supervisory staff member sometimes have difficult situations with employees. Aspirus EAS counselors are available to consult with supervisors about how to effectively handle complex situations. Trainings - Employers have a variety of training topics to choose from. Trainings fall into two areas: for employees and for supervisors. Training may be offered in the following formats: in-person, conference call, or webinar. Trainings may need to be offered more than once due to the number of employees & supervisors you have, training room size limitations, multiple shifts, or other factors. Everyone at some time is faced with personal problems. 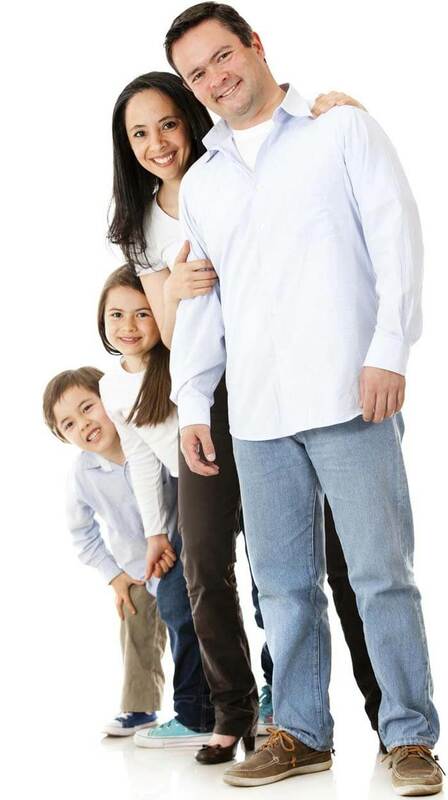 In most cases, we are able to resolve them, but sometimes we or a family member needs some help. Employee Assistance Services is available for stress management, household or marital problems, alcohol or other drug abuse, emotional or behavioral difficulties or personal conflicts. The employee is the individual who works for a company that has contracted with Aspirus Employee Assistance Services (EAS) to provide services. In addition to the employee, individuals who live with the employee may utilize this program for short-term counseling services. A household member who lives with an employee. 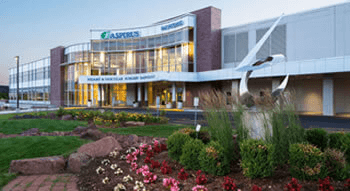 Any contact that you have with Aspirus EAS is confidential, whether that contact is by telephone or at a pre-scheduled meeting. All records of Aspirus EAS are also confidential. No one outside of Aspirus EAS, including your employer, will know that you are using this service, unless you request notification with a signed release. However, counselors are required by law to report situations that indicate a person is a danger to him/herself or others, and cases of suspected of child or elder abuse. When you contact Aspirus EAS during our normal business hours you will talk with a support staff person who can answer initial questions. If this is your first time calling or if it has been numerous months since you last called, you will then be transferred to one of our counselors who will briefly visit with you about your concerns. Our offices are located in Wausau, Stevens Point, and Wisconsin Rapids, Wisconsin, If you are near one of these communities you will meet with one of our counselors. For those who live outside of these areas, you will be referred to one of our contracted counselors in an area more convenient to you. You may contact EAS anytime day or night. If you call outside of normal hours of operation, you will be talking with our answering service. Leave a message and a member of our staff will get back with you as soon as possible the next business day. If you wish to speak with a counselor right away, you will be transferred to an on-call counselor, generally within a matter of minutes. EAS Helpline: 715-847-2772 or 1-800-236-4457. Q. When would I call Aspirus EAS for help? Answer: An employee, their spouse, or other member of the household can call us 24 hours a day, 7 days a week. You can call in regards to any problem, whether it’s stress, depression, alcohol or drugs, financial, legal, children, parental, or spousal. Answer: There is no cost for the first. At the end of the initial session, the client will receive recommendations from the counselor if further counseling will be short-term or long-term. If short-term counseling is warranted, then the counseling sessions (up to a predetermined number) are at no cost to you. Q. How do I call Aspirus EAS and what should I expect when I make a call? Answer: Your first step in receiving help is to call the Helpline at 715-847-2772 or 1-800-236-4457. You will be directed to a counselor who may ask you a few quick questions. Q. What is short-term counseling? Answer: Short-term counseling is best described as short-term problem resolution. The counselor is following what we call “solution-focused counseling.” This means the counselor is helping you with problem identification, problem clarification, and problem prioritization, working towards resolution. Q. Does Aspirus Employee Assistance Services utilize my health insurance? Answer: No, the employer through whom you are eligible has entered into an agreement with Aspirus EAS to provide short-term counseling. Q. How many times can I attend counseling? Answer: If it is determined by the counselor that short-term counseling is warranted, the client is entitled up to the contracted sessions per episode of need. Q. What is an episode of need? Answer: When a client meets with a counselor and each session relates to that same personal issue, then those sessions fall within the same episode of need. For example, if a client sees a counselor for six sessions due to the death of a spouse the six sessions fall within the episode of need. 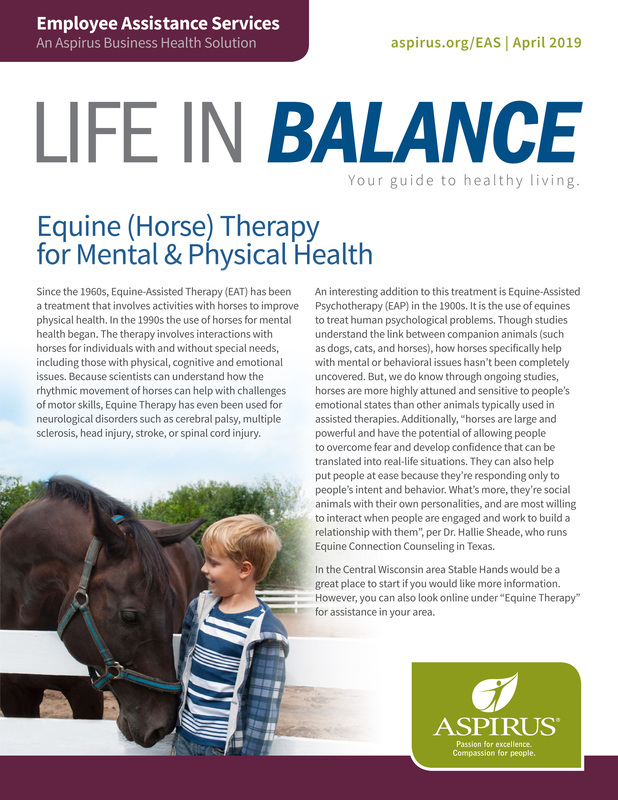 Check out the latest edition of Life in Balance, a monthly newsletter from Aspirus Employee Assistance Services.